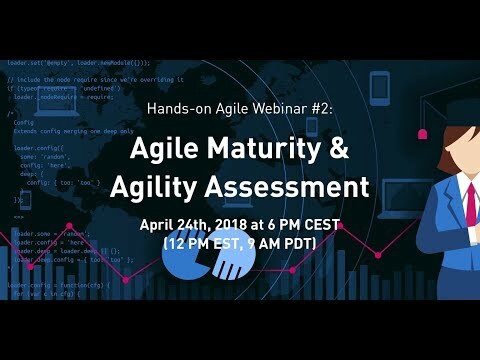 Note: If the browser will not video automatically, click here to watch the replay of the webinar agile maturity and agility assessment directly on Youtube. Measuring agility is nothing new. There are plenty of tools and approaches available, starting with Crisp’s Scrum Checklist to James Shore and Diana Larson’s Agile Fluency™ model. Measuring agility of prospective clients has become a valued presales tool for many consultancies, too. What is missing today, though, is an open-source and thus widely available framework that any agile practitioner can use to get an understanding of her organization’s or team’s level of agility. On February 3rd, 2018, 20-plus people will join a hackathon to build an agility assessment framework based on taxonomy described below. The goal of the workshop is to provide the first version of a tool that empowers agile practitioners to measure agility. What are the necessary steps to get there? The Berlin hackathon will be an experiment. For example, I wonder if we can apply analytical thinking–such as measuring factors and calculating states—to complex social systems? Or will that approach turn out to be a dead end? What factors contribute to a team’s growing maturity in agile practices? What maturity levels do you see at a team level? What factors contribute to becoming an ‘agile’ or a learning organization? What maturity levels do you see at an organizational level? In total, 86 people participated in the survey: 13 from the corporation I am currently supporting and an additional 73 participants from the Age-of Product mailing list. Gemba and Kaizen become standard practices. From project budgets to product teams. Measuring elements of agility at an organizational or team level is nothing new. This ‘agility assessment framework’ approach, however, is new as it aims to be the first open-source and thus widely available tool for all agile practitioners. It is unlikely that the first planned workshop will deliver more than a rudimentary prototype of the agility assessment framework. However, it will be a start to gather more insights by applying the framework to real-life work situations and take it from there. Hopefully, we will be able to establish a community around the ‘agility assessment framework’ in the future. Any update on the open-source agile assessment framework referenced in this article? We’re interested in running something like this for a large consortium in WI. Thanks! We are still working on the whole thing. Next workshop will be on April 14th. what was the outcome of this workshop? Would love to dig deeper into that! Drew, there won’t be any remote collaboration offering until we figured out a way to work together at the workshop.